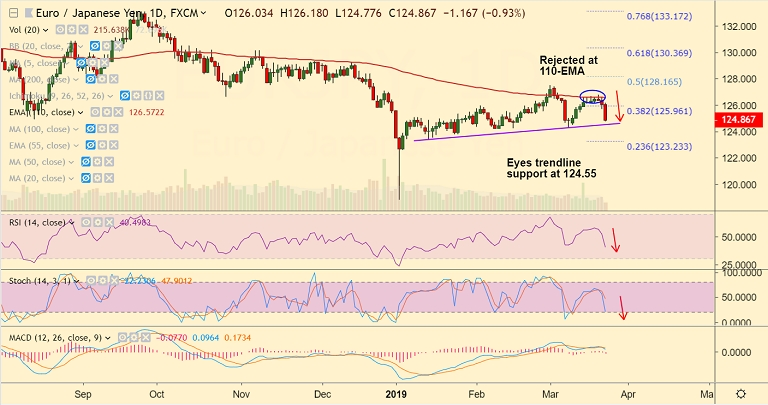 EUR/JPY is extending weakness after rejection at 110-EMA. The pair is trading 1.14% lower on the day as the single currency dumped across the board. The latest disappointment from German/Euro-zone manufacturing PMI prints helped reignite global growth worries, denting euro. The pair has slipped below 50-DMA at 125.30 and is hovering around trendline support at 124.55. Break below will see test of 123.40 (Jan 15 low) then 122.80 (Lower BB). Immediate resistance is at 125.83 (55-EMA), bearish invalidation only above 110-EMA. Call update: Our previous call (https://www.econotimes.com/FxWirePro-EUR-JPY-Trade-Idea-1514343) has hit. Recommendation: Book partial profits at lows, watchout for break below 124.55 for further weakness.